Hey look, honey, fresh from the small cabin in the woods! That is the main ingredient in Nosyebonk's famous Face Cake! Ji-san. Only 1000 en each. Today they'll only cost you a leg! fresh wrapped heads 10 yen per kilo. 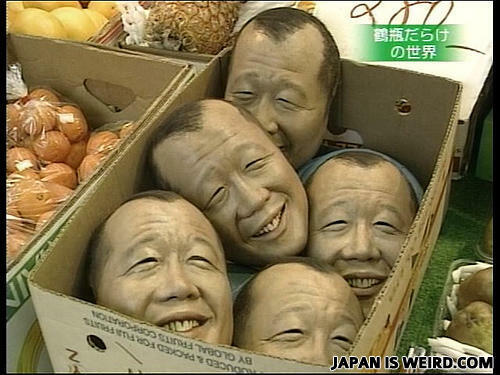 The first attempt to clone potatoes was undone when Satahara jizzed in the experiment. so they DO have Gilbert Gottfried trees! Shōfukutei Tsurube (笑福亭鶴瓶) is a famous comedian in Japan. I guess this was a prank. I would have a heart attack if I saw that at my grocery store. why they look so sleepy?